When the Manistee Planning Commission voted 5-0 on January 7, 2016 to grant a Special Use Permit to Per Wickstrom's TIA Corporation to use 900 Vine Street as a “location for recovery meetings” and “intensive outpatient services”, I'm betting it never imagined the site would become the new home of the Church of Scientology's education front, Applied Scholastics. But it has, and it's not the only Wickstrom-related site in Michigan promoting L. Ron Hubbard's Study Tech. And Wickstrom has designs on other Michigan locations and in South Bend, Indiana. Read all the details and see the exclusive images. As has been pointed out before, Applied Scholastics claim to be 'totally seperate' from $cientology is a lie. They obtained their 501(c)3 status, and were assigned Group Exemption Number 4171, as part of the 1993 Closing Agreement between the IRS and $cientology. If they're going to claim being completely seperate, they need to turn in the GEN, and every Applied Scholastics operation apply for tax exempt status individually. The social benefit and other public benefit entities discussed at pages 1-28 through 1-42 of the June submission along with all subsidiaries, subordinate chapters, subordinate organizations, or sublicensees thereof (e.g., organizations that are permitted to use particular names, copyrights, service marks, and/or technologies) are Scientology-related entities. and the Foundation for Religious Freedom are Scientology-related entities. Pages 1-28 through 1-42 are attached as Exhibit VIII-2 to this Agreement. 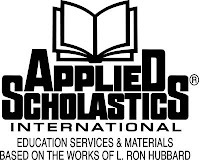 "Applied Scholastics Incorporated is ostensibly a completely separate organization from the Church of Scientology. It is a separately incorporated body with its world headquarters at 7060 Hollywood Boulevard in Los Angeles, California—as much as my liver is separately incorporated within my abdomen." I'm just a little devil.